Ep. 87 Six Words an Artist Must Ban: "I shouldn't have to do this!" The Rock Star Branding Podcast, August 6, 2014 - Ep. 87 Six Words an Artist Must Ban: "I shouldn't have to do this!" Join Brian Thompson, Michael Brandvold & Ron Young. We are joined by our brand new co-host rock star Ron Young of Little Caesar. For those of you unfamiliar with Little Caesar, they were signed to a major label deal with DGC/Geffen Records in 1989 and had two big singles, "Chain of Fools" and "In Your Arms". Positioned as the next big ... See More thing, Little Caesar were managed by a team of industry bigwigs, including Jimmy Iovine, A&R by John Kalodner, and with Bob Rock producing their debut album. 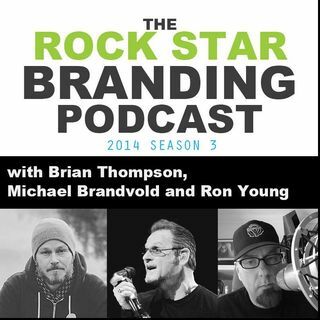 Each week Michael, Brian and Ron will discuss rock star branding related to some of the largest acts in the world and how you can apply their lessons to your career. Download The Rock Star Branding Podcast from iTunes. Listen to The Rock Star Branding Podcast on SoundCloud. Follow the Rock Star Branding podcast on Facebook. If you like the podcast I ask that you visit iTunes and please Rate & Review The Rock Star Branding podcast.